In the present climate of economic crisis, when inflation, bankruptcy and strikes are the order of the day, it is refreshing to read the annual accounts of a company which prospered in the early years of this century. The Wantage Gas Works was such an organisation and it came into being during the Victorian era of enterprise and hard work. The men who started the company were the same men who started all the other business enterprises in Wantage. Names like Ormond, Stevenson, Kent and Castle cropped up time and time again as the directors of concerns such as the Wantage Tramway, the Wilts and Berks Canal, the water works and the gas works. They also figured prominently on the Town Council, on the local church committees and as school managers. 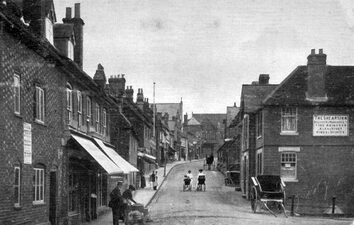 In her book Victorian Wantage, Kathleen Philip tells how the Town Commissioners of Wantage took some time to consider the use of gas as an alternative to oil for lighting the town’s streets. One of the commissioners suggested gas in 1845, but at the time his colleagues decided that they could not afford such a venture. However, two years later the commissioners did decide to light Wantage by means of gas and the gas company was allowed to start laying the necessary pipes. A representative of the company said that the cost to supply each lamp would be £2 per year. The commissioners were to be responsible for the fittings for the lamps. The bill for the gas came to £86.10s.0d. (£86.50p) for many years, but after a time the cost began to increase gradually. In 1869, for instance, there were eleven private lamps at £3 each per annum and fifty-four public lamps at £2.5s.0d. (£2.25p) each, making a total of £154.10s.0d.(£154.50p). When Isambard Kingdom Brunel constructed the Great Western Railway from London to Bristol in the late 1830s he naturally selected the easiest route through the Vale of White Horse and left Wantage in isolation over two miles from the line. As a result, coal for the gas works reached the town by way of the Wantage branch of the Wilts and Berks Canal for more than thirty years. In fact the canal, which ran from Semington on the Kennet and Avon to Abingdon-on-Thames, was built specifically to carry coal along the White Horse Vale. This originated from the Somerset Coalfield and was carried to the K & A along the Somerset Coal Canal. However, Wantage Tramway was opened from Wantage Road Station to a terminus in Mill Street in 1875 and when its goods service was firmly established it started to carry coal for the gas works. In addition, the by-products of gas manufacture were carried from the town on the tramway. The venture proved profitable to both enterprises and the gas company was soon provided with its own siding to facilitate ease of loading and unloading. Transporting the 'ammoniacal liquor', which was one by-product of the gas works, sometimes caused problems for the tramway company. The minutes of the latter for May 2, 1889, state that the price for conveying the liquor ‘in a Water Tank Truck’ would be reduced from 2s. (10p) to 1s.6d (7p) per ton. While on April 6, 1891 the manager of the gas works was to be informed that the liquor tank was not to be allowed to travel on the tramway until it had been repaired ‘as it has several times left the rails’! Ammoniacal liquor also figures in the statement of accounts put out by the gas works for the year ending March 31, 1904, which show that together with tar it made an income of over £92 in the year. The company also made more than £350 from the sale of coke and, in addition, somehow managed to make over £6 from the sale of refuse. Naturally the biggest source of income was from the sale of gas which retailed at 4s.7d less than 25p) per 1,000 cubic ft. Wages and salaries cost the company a mere £366 in a year and the biggest expenditure, over £1,195, was on coal which was purchased for around £1 per ton! The capital account shows that the company borrowed £7,000 between 1879 and 1884 to improve the works and had repaid nearly £4,470 by 1904. The balance sheet indicates that the company owed just under £750 on unpaid accounts, but its customers owed nearly £830 on uncollected accounts and the company turned in a healthy gross profit of £556 according to the profit and loss account. The concern continued in business through World War One, the Depression, and into World War Two, and presumably it made a reasonable profit most of the time. However, by the end of the second war much of the company’s machinery was in need of repair and, due to general shortages, replacements were difficult to obtain. In 1945 the Oxford Gas Company offered to purchase the Wantage works with the intention of closing it down and supplying gas by pipeline from Oxford. At about the same time the Wantage Tramway Company was contemplating closure because of the sorry state of its rolling stock; undoubtedly the likely loss of some £400 revenue from the gas works had considerable influence on its final decision. There is no doubt that the two concerns were very dependent on each other. The gas works could not easily do without the transport facilities provided by the tramway and the tramway certainly could not afford to lose one of its best customers. In any event the tramway closed down in December 1945, and the gas works was eventually purchased by the Oxford company. Closure of the Wantage Gas Company was inevitable. Nationalisation of the industry came soon after the war and if the works had survived that trauma the introduction of natural gas some two decades later would certainly have ensured closure. Now there are no remains left which are recognisable as having been part of the gas works. The space which was once occupied by the retorts and gas-holders is now a car park but the manager's house is still inhabited and the building which was the company office now serves as a cafe. Gone for ever are the days when coal costing about £1 per ton was used to produce gas which sold for just under 25p per 1,000 cubic foot. This article was originally printed in “The Blowing Stone” Spring 1985. The Vale and Downland Museum is a registered charity (No. 270466) which aims to preserve and provide information and objects relating to the Vale and Downland area, Wantage, Oxfordshire. The Museum encourages access to historical records for non-profit making purposes. This article may be used for such purposes, however the information must not be edited or reproduced for commercial purposes without prior written permission.